I wouldn’t say I hate winter squash, as in the way former president George Bush famously hates broccoli. It’s not something on my regular grocery list either. Is it the texture I don’t care for? Partly, yes. I also find winter squash to be, well, stodgy. My tastes in vegetables, even on the dreariest winter day, run to lighter flavors and greener colors. Give me some stir-fried beans or kale any time, especially with a smashed garlic clove and a squeeze of lemon. 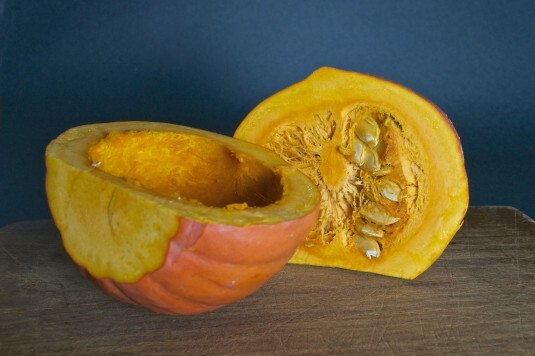 In appreciating winter squash for what it has to offer, I wanted to highlight its vibrant orange color, play up its sweetness (by roasting it) and balance the sweetness with some spice. The end result is a creamy coconut curry soup, which reminded me of my favorite curry at our local Thai restaurant. Red curry paste with red kuri squash sounds like it was meant to be, doesn’t it? This is a good weekend afternoon project, a day when it’s pouring with rain or blowing a gale outside. It’s a simple recipe but a small investment in time, close to an hour once the squash is roasted and the soup puréed and reheated. It makes a flavorful and substantial meal on its own, with a fantastically bold orange color and some added crunch from sliced green beans and red peppers. For a protein boost we tossed in cooked turkey (as shown in the photos here) but chicken, prawns or tofu would also work well. And who knows? Maybe winter squash will work its way onto my grocery list this year after all. 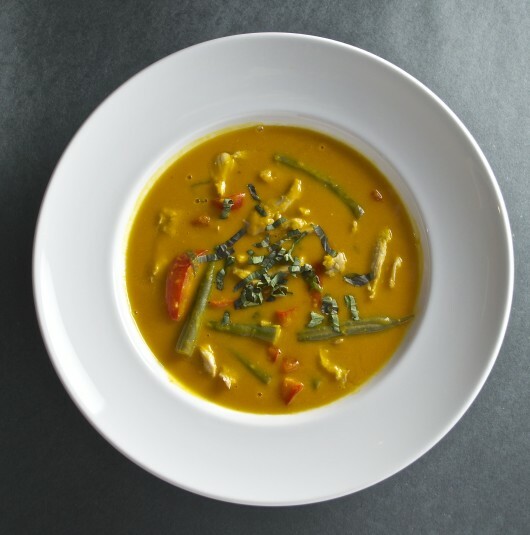 Reminiscent of a Thai curry, this is a slightly spicy, creamy soup that highlights the sweetness and color of winter squash. Preheat oven to 350F. 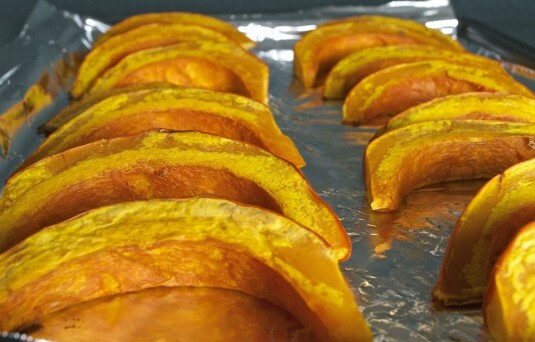 Cut the squash into 1-inch strips and place on a foil-lined baking sheets. Drizzle 1 tablespoon of the olive oil on the squash and use your hands to coat each piece. Place the baking sheets in the oven and roast for 15 minutes. Turn the slices over and roast for another 10 minutes, or until just tender when pierced with a fork. Let cool and cut into cubes. 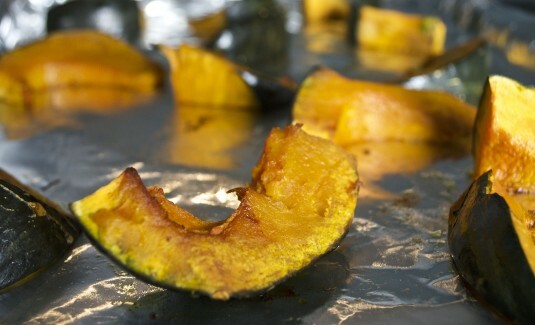 You should have about 3-1/2 cups of roasted squash cubes. In a large saucepan or stock pot, heat remaining 1 tablespoon oil over medium heat. Add garlic, ginger and onion and cook, stirring frequently, for 3-4 minutes or until the onion has softened. Add the curry paste and stir it with the ginger-garlic-onion mixture for 2 minutes. Add the roasted squash cubes, coconut milk, 2 cups of chicken stock, fish sauce and coconut palm sugar. Bring mixture to a boil, reduce heat to low and simmer for 5 minutes. Remove from heat. Transfer the mixture to a food processor fitted with the blade attachment and process until smooth. Return the pureed soup to the saucepan over medium heat. Add 1-2 cups chicken stock (depending on how thick or thin you prefer your soup). Add the kaffir lime leaves, Thai basil, red pepper and green beans. Bring to a boil, then reduce heat to low and simmer for 8-10 minutes or until the beans are tender. Serve immediately. 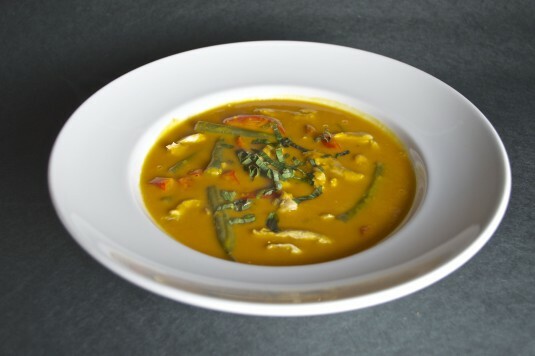 We love your (Eve and Kris) Coconut Curry Squash Soup. 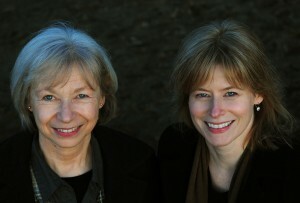 Thanks for aunt and niece recipe. Thank you, Aftab — we’re glad you enjoy it!